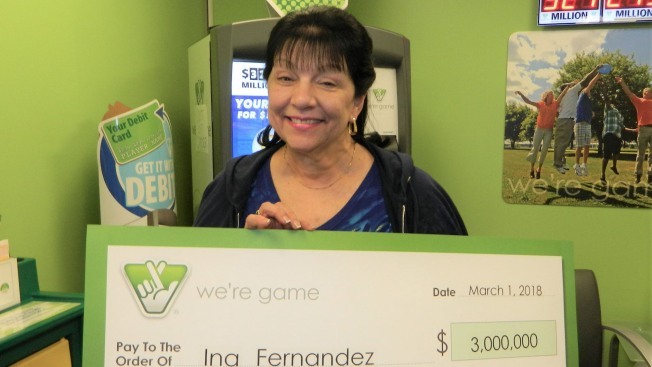 Ina Fernandez cashed in her winning ticket just before it was set to expire Monday. Photo courtesy of the Virginia Lottery. A Northern Virginia woman claimed a $3 million prize from the lottery, just days before her winning ticket was set to expire. Ina H. Fernandez of Loudoun County kept her multi-million dollar ticket hidden in a drawer for almost six months. She didn’t even tell her her husband for two months after learning she won the money from a ticket with randomly-selected numbers. “I just wanted to think about it and take care of our finances,” Fernandez said. Since nobody had come forward to claim the prize for months, the Virginia lottery announced the winning ticket would expire six months after the drawing -- March 5. Fernandez went public with her ticket just before the Monday deadline. Fernandez, who is retired, said she intends to help her family with her winnings. The winning numbers in the Sept. 5 drawing were 11-17-59-70-72, and the Mega Ball number was 1. Fernandez’s ticket matched the first five numbers, but her $1 million prize was tripled because she spent an extra dollar for the Megaplier when she bought the ticket. The odds of matching the first five numbers in the Mega Millions lottery are 1 in 12,607,306. Fernandez’s $3 million winning ticket came from the Giant Food store located at 21000 Southbank St. in Sterling, Virginia.